Manually- defined: benchmarks can be defined by the administrator for a project. Manually-defined benchmarks are usually computed using historical data or are expected proficiency measures set by a company. Setting up your feedback project to include automatically-created benchmarks is easy. Benchmark scores are, by default, generated every time a report is run. The only thing you, as the administrator, need to do is to make sure that your report template includes components with benchmark scores turned on. Create a feedback report template using editable components. For help on how to do this, please see the article on creating editable report templates. Click the "Settings" link next to the name of the report component you want to have display benchmark scores. 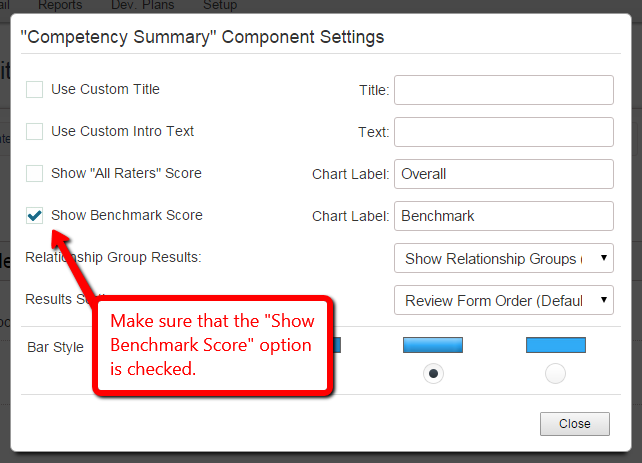 If benchmark scores are available for the selected component, an option titled "Show Benchmark Scores" will be visible with a checkbox next to it. Check the checkbox to activate the display of benchmark scores. Optionally, you can also change the label that is shown in the reports by altering the "Chart Label" value. The next time you run a report with this template, benchmark scores will be visible. Creating Manually- defined benchmarks for your project requires a few additional steps, but is helpful in situations where you want control over what benchmark values are displayed in the report. Benchmarks can be created for individual projects. With the Enterprise edition of the tool, you can even have multiple "benchmark profiles" in each project (explained below). Finalize your project's review content first. Make sure your items and competencies are not likely to change. 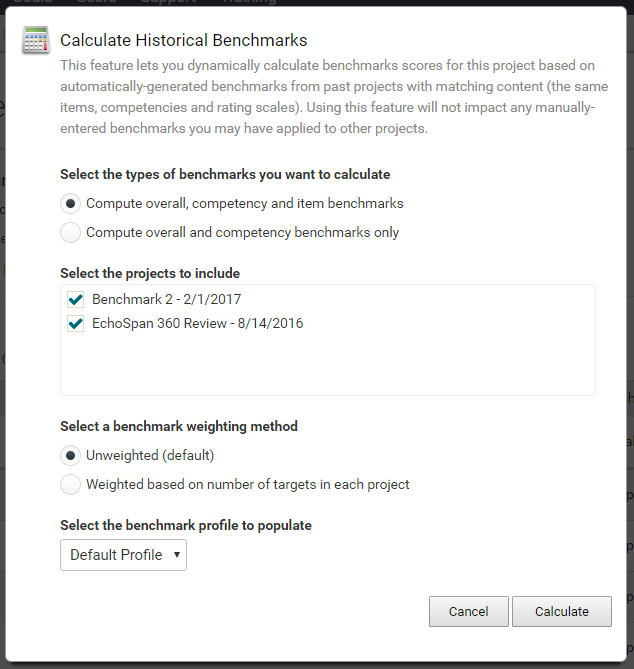 Navigate to the Reports >> Custom Benchmarks menu option in your project. At the top of the page, click the "Manually- defined" benchmarks radio button to activate Manually-defined Benchmark Scores. Next, enter your desired Benchmark Scores. You'll see a list of all of your project's competencies and items along with a Benchmark Score text field to the right of each of them. The first time this page loads, all of the Benchmark Score fields will have the value "0.0" in them. Just replace this value with your desired item or competency benchmark score. The fields save your entry automatically, so there's no need for a "save" button. If you do not wish for a particular item or competency to display a Benchmark Score, just leave the default 0.0 value and it will be omitted from reporting. Benchmark Scores have a standard precision of one decimal place. Activate the display of your benchmarks in your reports by following steps 1-3 of the "Configuring Automatic Benchmarks" section above. This feature applies to the Enterprise Edition of EchoSpan only. At the top of the page, click the "Historical" benchmarks radio button to activate Historical Benchmark Scores. You will see there are two choices of benchmarks: 1) Overall, competency and item; and 2) Overall and competency only. When you click which type of benchmark calculation you want, the system goes to work and produces a list of projects that are compatible with that type of calculation. In other words, if you select choice #1, all items and competencies must have the exact same wording throughout the review. Check the projects you want to include in the calculation. Note that you have to explicitly select the project you are working in if you want to include the benchmark for that project in the score. Also note that password protected projects are always excluded from this list and cannot be used in historical benchmark creation. After checking the projects you want to include, select the weighting method you want to use. There are two to pick from, unweighted and weighted. 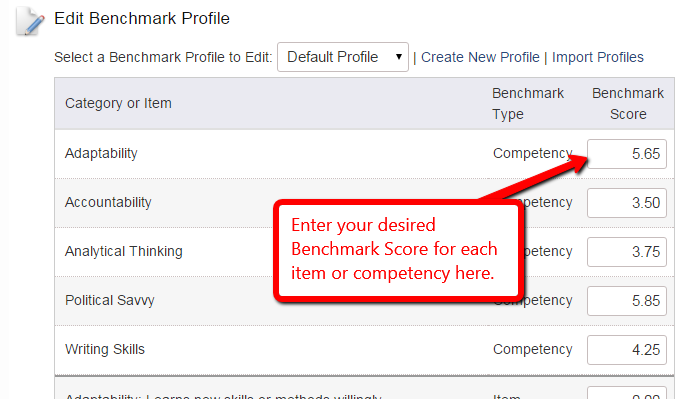 Select the benchmark profile you want to deposit the resulting scores into. Then, click the "Calculate" button. Benchmarks are computed in real-time. There may be instances when you want to have multiple benchmark sets in a particular project. For example, a project may contain Targets in multiple levels or roles in your organization (i.e., Executives, Associates, Managers), and you want to present distinct benchmarks in their reports based on their peer group. In these cases, a single benchmark set will not work, as benchmarks would be the same for everyone. The solution is to create distinct Benchmark Profiles within your project, and then assign Targets to profiles as appropriate. From the Configure Custom Benchmarks page, click the "Create New Profile" link. In the pop-up window that appears, enter the name of your new Benchmark Profile and click the "Submit" button. The page will refresh with your new Benchmark Profile active. Enter the desired Benchmark Scores for the profile. Rather than creating Benchmark Profiles from scratch for every project, you can import Benchmark Profiles from other projects with just a couple of clicks. From the Configure Custom Benchmarks page, click the "Import Profiles" link. In the pop-up window that appears, select the project containing the Benchmark Profiles you want to import and click the "Import" button. Once you import benchmarks, you can edit them in this project without affecting the source project's benchmarks. Note that importing profiles will overwrite all profiles existing in the project. Additionally, the content (items and competencies) of the source project must match the current project's content exactly in order to import benchmarks. The page will refresh with your newly imported Benchmark Profiles active. Enter the desired Benchmark Scores for the profile. Unless otherwise assigned, all Targets are associated with the "Default Profile" Benchmark Profile. You can designate which Benchmark Profile to which a Target or group of Targets should be associated either at the time Targets are uploaded, or after they have been entered into the system. In the administrative tool, Select Targets >> Import From Excel from the main navigation menu. Paste your upload template into the text box. 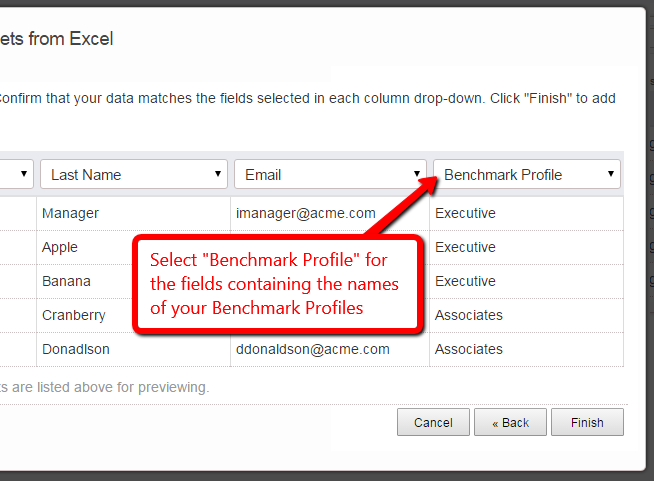 Be sure that your upload data contains a column for Benchmark Profile, and that the values in the rows for this column match the names of your Benchmark Profiles exactly. Click the "Next" button and assign your Benchmark Profile values to the correct upload column using the drop-down selectors. Click the "Finish" button to complete your upload. When reports are run, Targets will be shown the appropriate Benchmark Scores based on their assigned Benchmark Profile. From the Project Dashboard, enter the new Target's details in the "Add a New Target" panel at the bottom right of the screen. Click the "Additional fields..." link. Enter the name of the Benchmark Profile you want to associate the Target with and click the "Submit" button. From the Project Dashboard, click the name of the Target you want to modify. On the Target profile page that follows, click the "Edit Target's Details" link at the right of the page. In the Edit Target pop-up window, enter or change the value in the Benchmark Profile field. Be sure that the value you enter matches a name of one of your Benchmark Profiles exactly. Click the "Save Changes" button. When reports are run, Targets will be shown the appropriate Benchmark Scores based on their assigned Benchmark Profile.